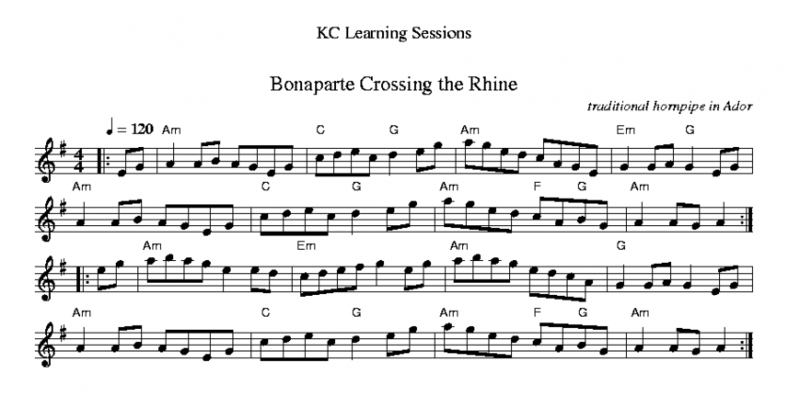 “Bonaparte Crossing the Rhine” is pretty common Ador hornpipe at Irish sessions in the US. Across the pond it’s played in Edor and called “Napoleon Crossing the Rhine.” It’s also known as “Listowel Hornpipe” and “(Farewell) Sweet Killaloe” in areas of New England. It has many other names as well, but most refer in some way to the petite Emperor who championed the metric system, universal property rights, as well as heralded the nation-state. Unfortunately, there are a number of other tunes which also share in some of these names, so beware of assuming a too close connection between titles and referents to avoid confusion. For instance there’s an Old Time tune, prevalent on Youtube, called “Bonaparte Crossing the Rhine” that is in D, and has nothing in common with our tune. On the other hand, a quick look at Andrew Kuntz’s site reveals that the Old Time tune “Bonaparte Crossing the Rocky Mountains” has the same A part and a very similar B part to our tune here. However, it’s played as a breakdown (i.e., up tempo reel) — the vast majority of Old Time tune are reels or waltzes (as is also true in Bluegrass). Also, it is presented in the key of C as it skips the sole F#. However, it resolves on an A note and Am chord. I’d argue the tune is actually still in Ador, it just doesn’t have a 6th scale degree. At any rate, our hornpipe here is in O’Neill’s 1850 (1903) under this same title, but as a march — it would be an infantry march, of course, which does seem apropos. The A part is said to be much older than the B part, and it is often claimed to be the predecessor of many other tunes and songs. In other words, it is the progenitor of a family of melodies we might call the “Bonaparte Crossing family.” In Irish sessions “Bonaparte Crossing the Rhine” is played AABB. This article was posted in ABC format, Dots, Hornpipe, Irish Tunes, Irish-American Culture, MP3, Slow Session, Tune, Tune Comment. Bookmark the permalink. Follow comments with the RSS feed for this post.Post a Comment or leave a trackback: Trackback URL. Thanks for the comment Judy. I played it with the F natural, and that works, of course. It doesn’t sound right to me, but that’s just because it isn’t the way I learned it. There is just the one F# in the B part, so it could be a variation? I don’t think the key signature is correct. I believe it should be no sharps or flats. Hey Judy, I’ve updated the description due to your comment. I looked on Andrew Kuntz’s site after reading your comment, and updated the description above accordingly. The Old Time tune “Bonaparte Crossing the Rocky Mountains” is essentially the same tune without the F# and so is presented in C. However, the chords are the same and the tune resolves on an A rather than a C, and the Am chord resolves better.